Heroes, Hustlers and Horsemen is history like you haven't heard it before. These are whiskey-soaked, rough and tumble biographies about larger than life figures who shaped southern Alberta in the tumultuous late 1800s. 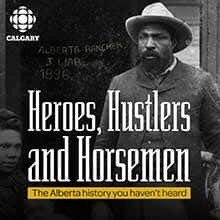 The story of a former American slave who became a legendary cowboy and rancher in southern Alberta. The story of a sharp-shooting scout with Blackfoot and Scottish heritage, who came to the aid of the North West Mounted Police when they first arrived in southern Alberta. A diplomat and a warrior, Potts bridged two cultures. The story of a Blackfoot runner once considered the 'fastest in the West.' Robbed of his greatest victory, Deerfoot's career brought out the best and worst of early Calgary. The story of an American Civil War soldier and whisky trader who became Alberta's first member of parliament. Davis was a master of reinvention. The story of a 'notorious' madam who ran brothels in early Calgary, when the prostitution business was booming.